Perhaps the silence itself speaks volumes about the dearth of Meerschaum pipes with decent stems. Perhaps someone in Turkey will seize on the opportunity to fill a gap in the market. One can only hope. My meerschaums all have good bits. they are all at least 35 years old though. I'm sorry but I can't speak to the quality of current manufacturers. Have you corresponded with any of the dealers supporting this site? They might have some insight in the current state of affairs with regards to meers. I like my IMP. Comfortable stem and large chamber. I have one Meer, and the stem is just as wide as my briars, and the draw is fine too. 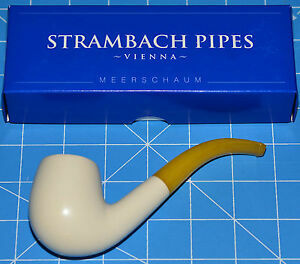 It is a Staumbach cultured Meerschaum, which I know turns some noses around here, but it is one of my favorite pipes. Peterson P lips, all the other companies having pipes made on the Isle of man, jambo, puffin etc have fair stems. IMP and Fikri Baki pipes both use standard briar mortise and tenon fittings instead of the threaded stems which are so prevalent in meer pipes. Baki uses vulcanite while IMP are acrylic. However, a meer pipe is a meer pipe and if the pipe is well made and features a modern airway one will smoke just like the next. Be sure to ask about the airway and stem fittings prior to purchase. Many older meers have narrow airways and screw on stems which can lead to wet smokes. Wow, thanks for shaking loose the cobwebs in my brain. 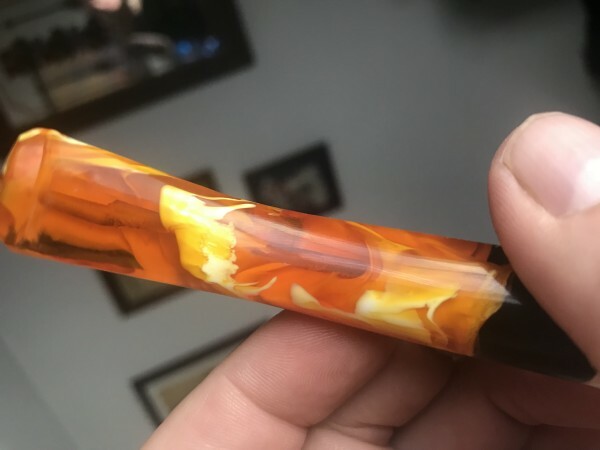 I have a Pioneer African Meerschaum from the Isle of Man in my collection already and had kind of forgotten about it since it doesn't look like Meerschaum (it's black).. And a Peterson meer with a p-lip would be a solid option. I have a Tekin and find it extremely comfortable. A few years ago, Walt Cannoy made a few meerschaums and while his stems are great, he made only a handful and they aren't readily available. 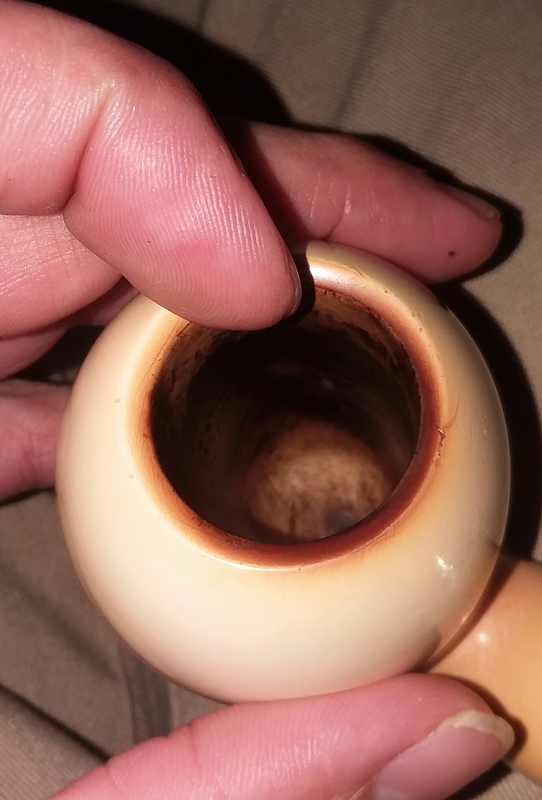 Mike Butera also made stems for some bowls that were made in Turkey. A couple of days ago smokingpipes had two Butera estate Meers on their site. That might be the best place to start. I'm happy with my Altinay acrylic yellow stem, fitted perfectly,button's ok and the airflow's pretty wide open(9mm) whereas the stem on my Tekin was just what you described ,chubby at button and stem was somewhat poorly fitted , so I had a replacement acrylic stem made by one of German based specialist and now this pipe shines. I recently acquired a Paykoc Meer. There is a definite flaw inside the stem. The airline through the stem does an bend right after the bit. It can be a damn pain using a pipe cleaner. I'm always bending them. 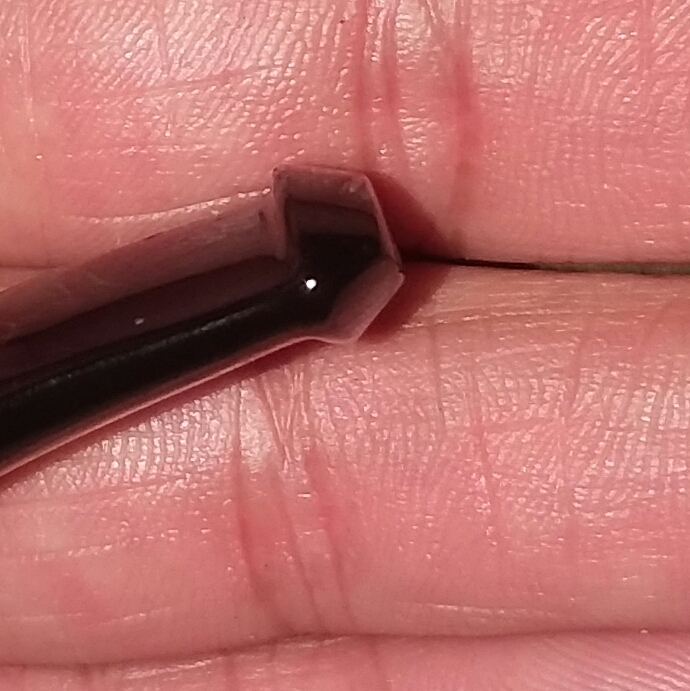 It has a clear acrylic stem, so I can visibly see the flaw. I bought it brand new, second hand though, so I can not return it. Otherwise the pipe smokes great and looks great. Ugh. Trying for a better sized pic.